These new baby chocolate shoes will make a unique gift which is sure to put a smile on both mum’s and dad’s face. 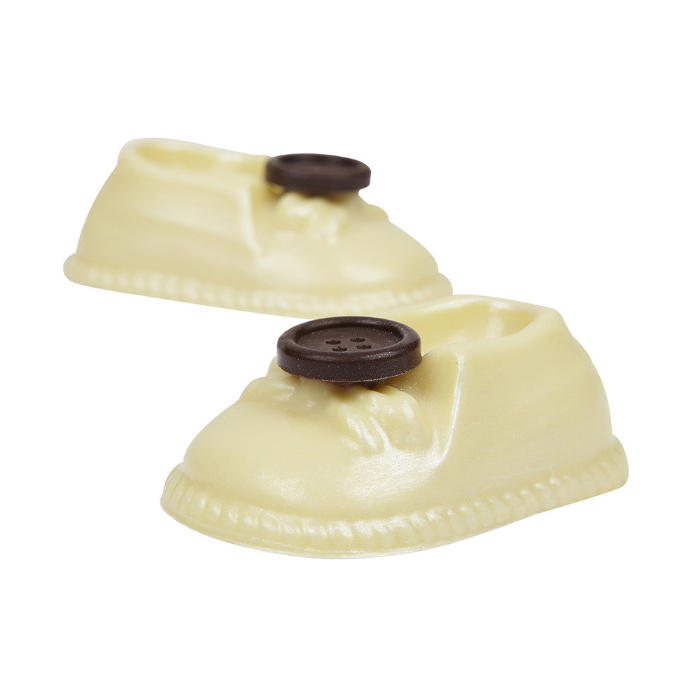 The solid chocolate shoes are made from white Belgian chocolate, finished with a dark chocolate button toe embellishment, packaged in a simple but elegant gift box and furnished with a keepsake baby key ring. Dimensions: Size of each shoe is 8cm from heel to toe and 5cm wide. Size of box is 14cm square with a depth of 5cm. Allergy information: Made in an environment which handles nuts and gluten. Delivery information Please allow at least 4-5 working days for individual gift items to be made before they are posted. All chocolate orders require a signature upon delivery to ensure their secure arrival. All deliveries will be dispatched or delivered on Tuesday, Wednesday, Thursday or Friday. This is simply because we do not want your chocolate sitting in a remote warehouse over the weekend. If it is not possible to accept and sign for the delivery at the address then a calling card will be left at the address advising of an attempted delivery and include a telephone number for you to call to arrange a re-delivery or for collection at your local Royal Mail sorting office. White chocolate min cacao solids 28%, min milk solids 22% Sugar, cocoa butter, whole (MILK) powder, emulsifier, (SOYA) lecithin, natural vanilla flavouring. DARK CHOCOLATE BUTTON: min cocoa solids 53%. EDIBLE LUSTRE DUST: E555 Potassium Aluminium Silicate, E171 titanium dioxide, E172 iron oxide. Let me initially say the product (when arrived) was great. However we were completely let down by the delivery. Despite many assurances (from the supplier) the product would be delivered on time for a particular event. It didn't. So in essence was useless to me. Yes. They have agreed to take the product back but at my cost!!! Which is not worth the time our effort involved.. Very disappointed.. Just felt the after sales approach was very poor..
Master chocolatier producing unique edible designer shoes and accessories.